I have been away for a few days, having traveled from Virginia to NC to complete (almost) an office/study design project. I had so much fun working on this and SW & BW seem delighted. There are just a couple of details left……delivery of a chair and making of the pelmet for above a large window. They have graciously said I can post the before and after, so as soon as I make one last trip to get final photographs I will post. I would also like to give a shout out to what I am sure is my youngest reader, well “looker” really, as she likes looking at all “the pretty pictures”. At just 4 1/2 years old, she was visiting her grandmother from out of state, and together they were read my post on Fairy gardens. This precious little one has a beautiful name “Jilan” (pronounced Jill On”), which means Happy Breeze on a Hill. Such a special name! She and her mother have a special fairy named “Laurel” that traveled with them from Ohio to her Grandmother’s home in Virginia, but stayed outside, preferring Grandmother’s maple tree, I am sure to better watch over them. Jilan has returned back home now, but from what I have heard via her grandmother, she still looks at my blog, apparently enjoying the post on Hydrangeas and revisiting the fairy garden post! Now that is humbling, and touching as well. You never know when blogging who might be reading or gazing at the photos, and whom you might inspire. So thank you little one for visiting and so happy you enjoyed the photos! 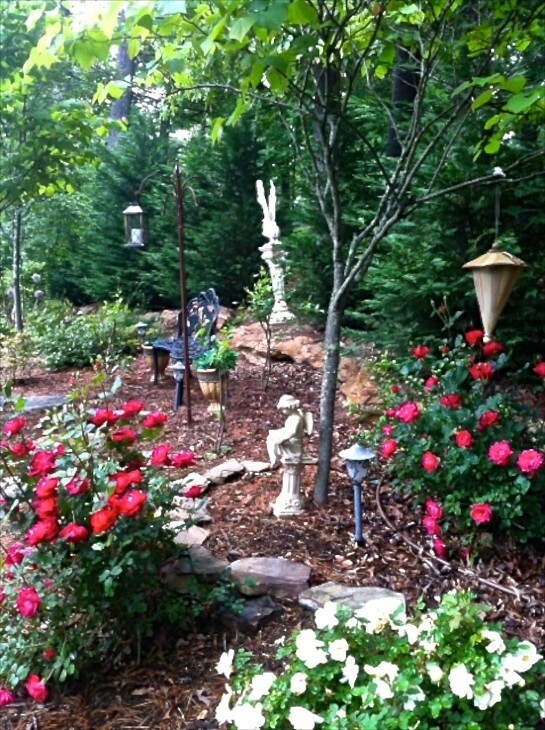 Today, I thought I would share the gorgeous garden of one of my readers from the western mountains of NC. 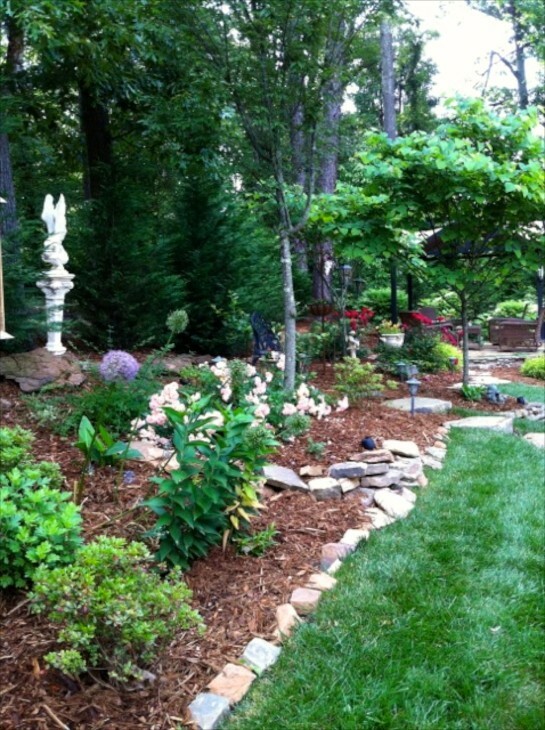 What is so impressive about this garden is they achieved this beautiful space by clearing, and creating the garden with hard work and all by themselves. It is made more impressive when you see the before photos. 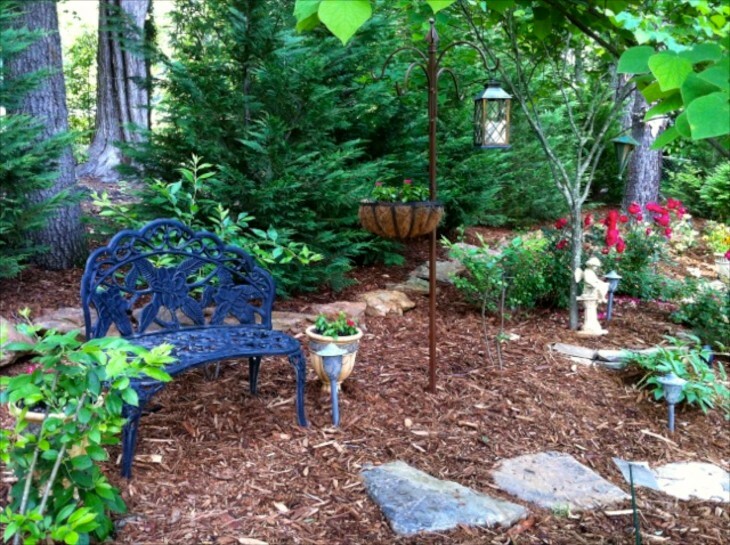 So let’s visit this beautifully designed garden that VM & RM have lovingly created, where they and their extended family often gather throughout the seasons. All photos by the owners. 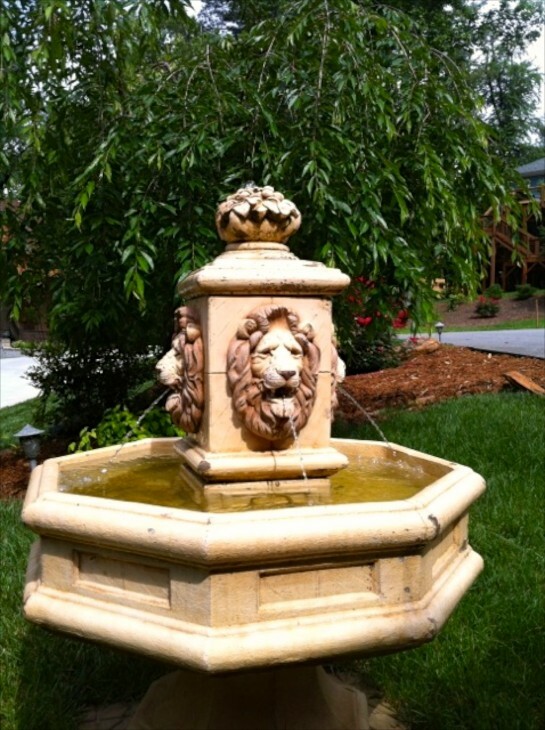 The soothing sound of water greets visitors in their front yard. 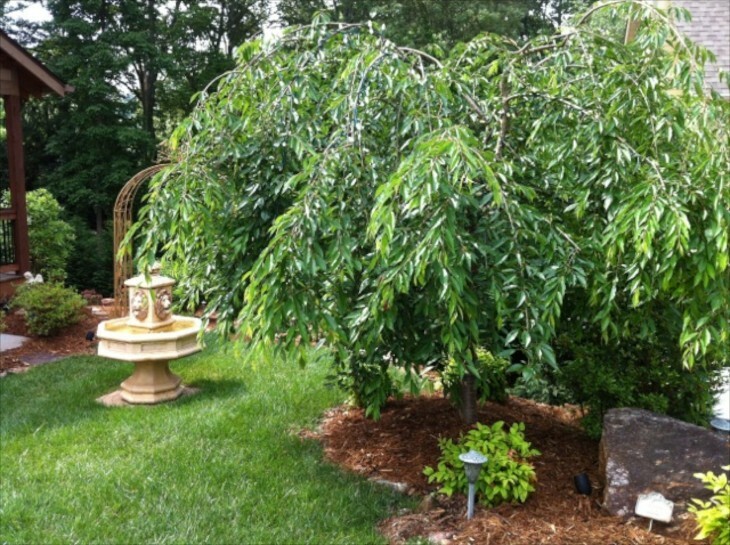 To the right of the fountain is a weeping cherry tree, one of the first trees to beigin blooming early spring. 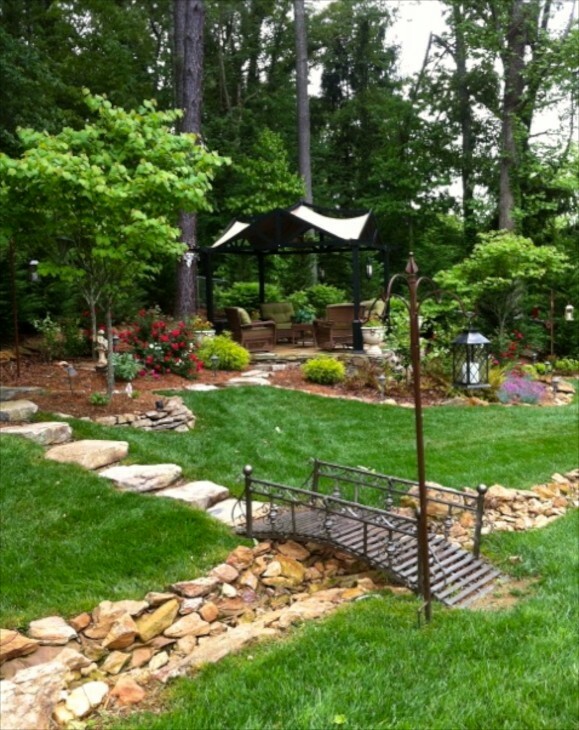 They began working on their garden in 2009, shortly after moving into their newly built home. Here is RM burning some of what they had to clear. 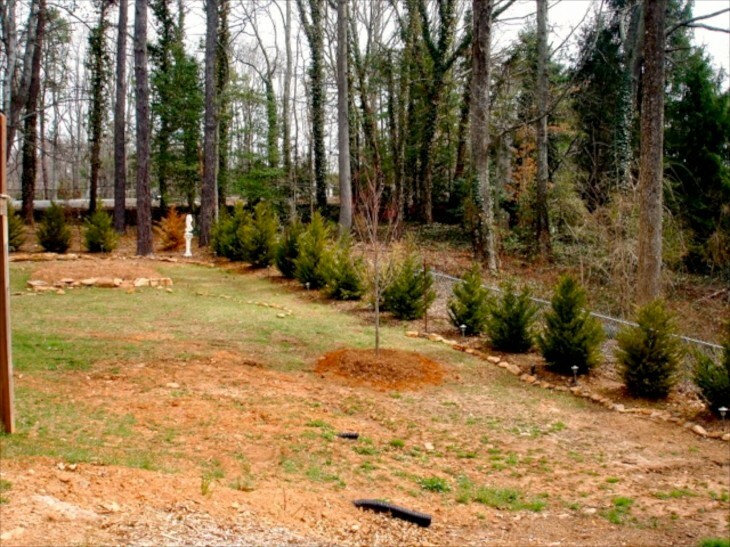 Notice some already laid rocks along the tree line. 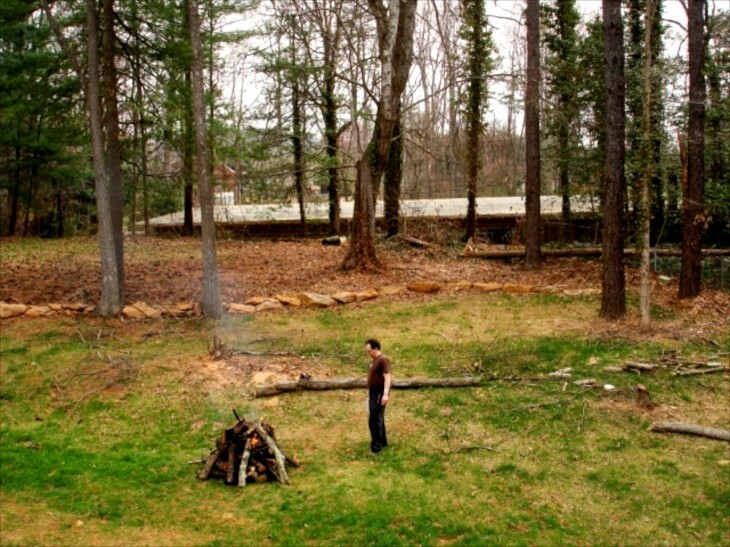 Before photo, showing where the Gazebo was eventually constructed at the back left in this photo. 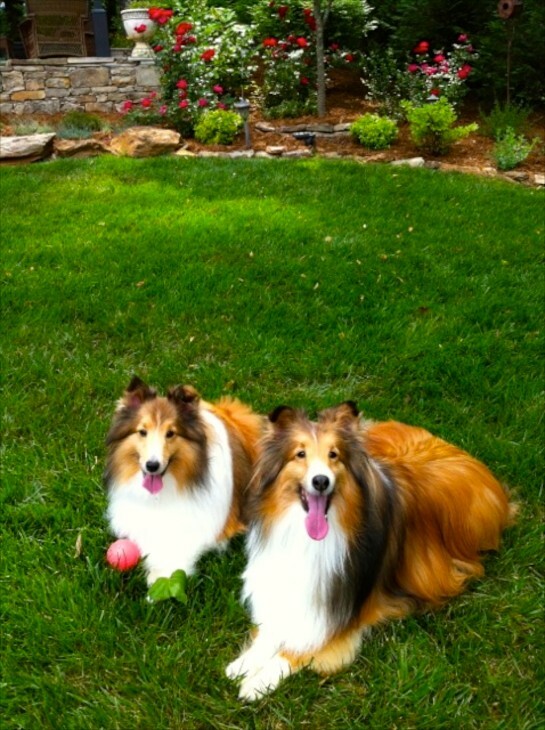 Here we see their two beautiful Shetland Sheepdogs ready to play ball in the garden. 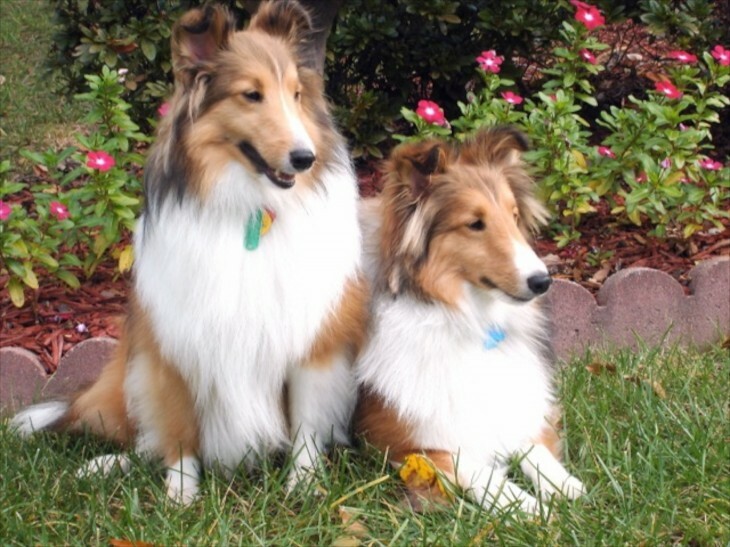 Mia is on the left and Connor on the right. 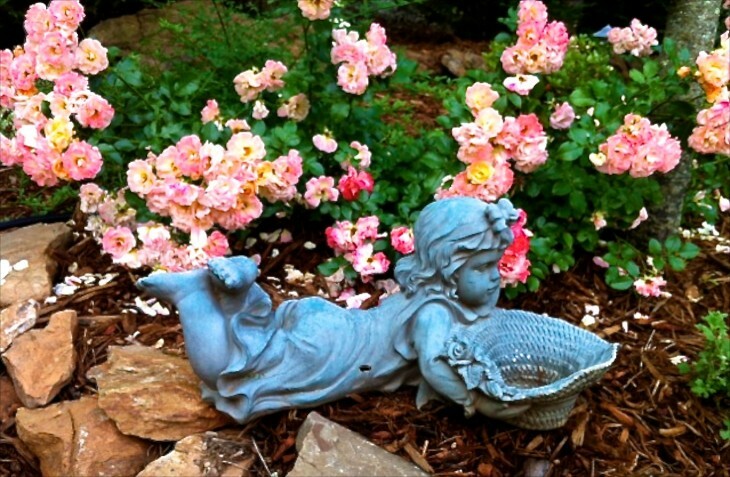 They are the official greeters for this family, be it in the house or outside in their garden. 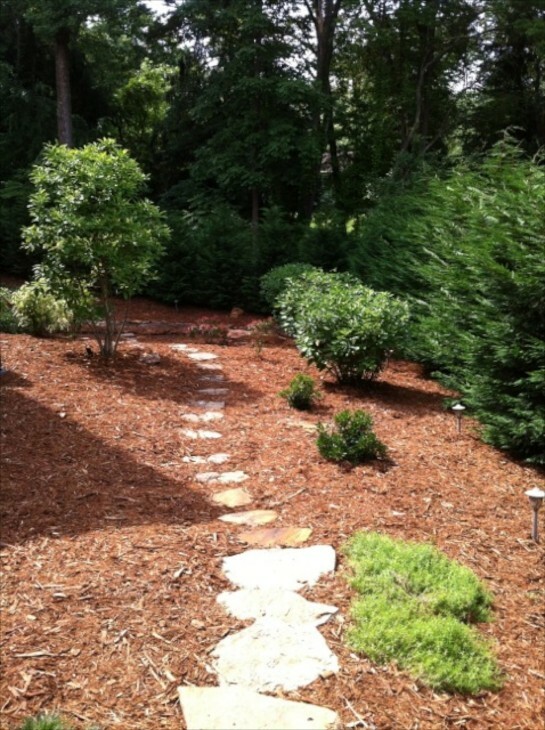 I love how this path entices you to want to see what is beyond the sight line. 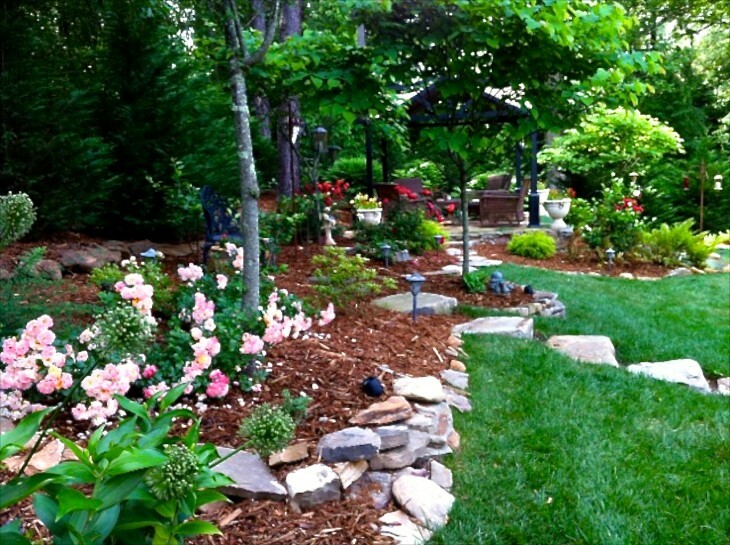 That is what helps to create an inviting garden……. 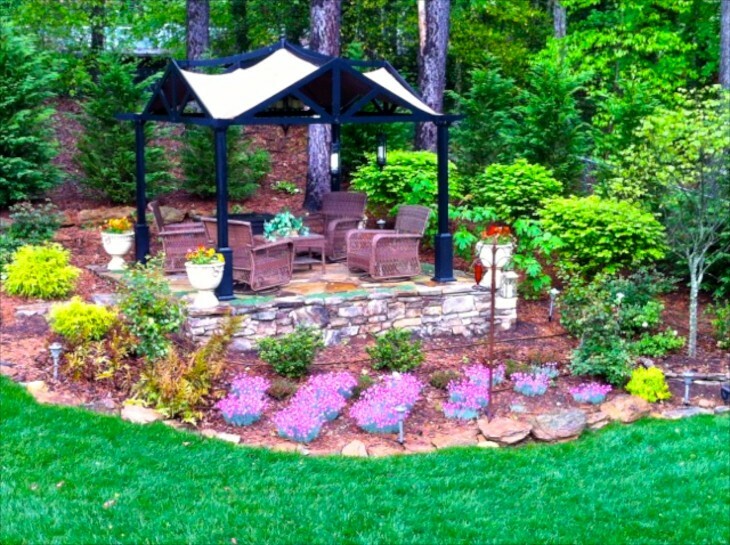 A far view of the gazebo. Remember the “before” photo above? My goodness!!! 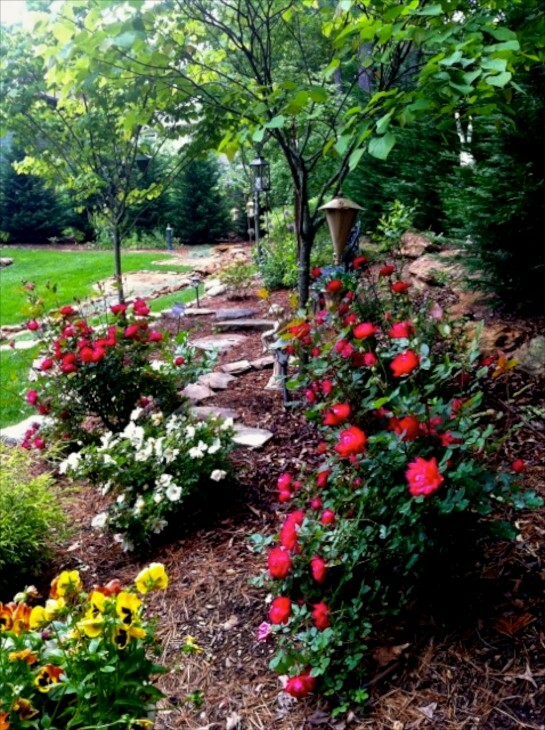 Lovely area with Roses. 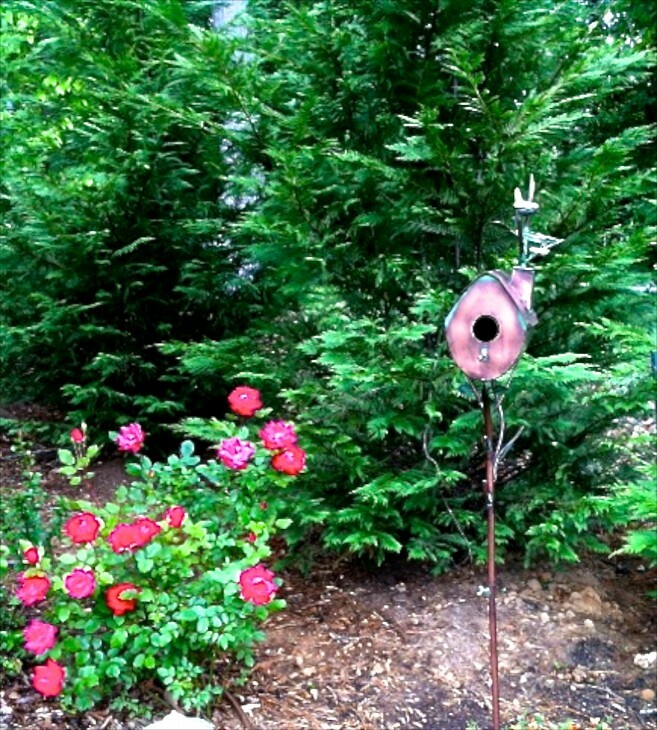 The various birdhouses, feeders and statues draw the eye to see it all. Wonderful evergreen background. Another view. Here we see closer up the lights that I am sure create an incredible panorama at night. This garden is breathtaking I am sure, no matter the season. 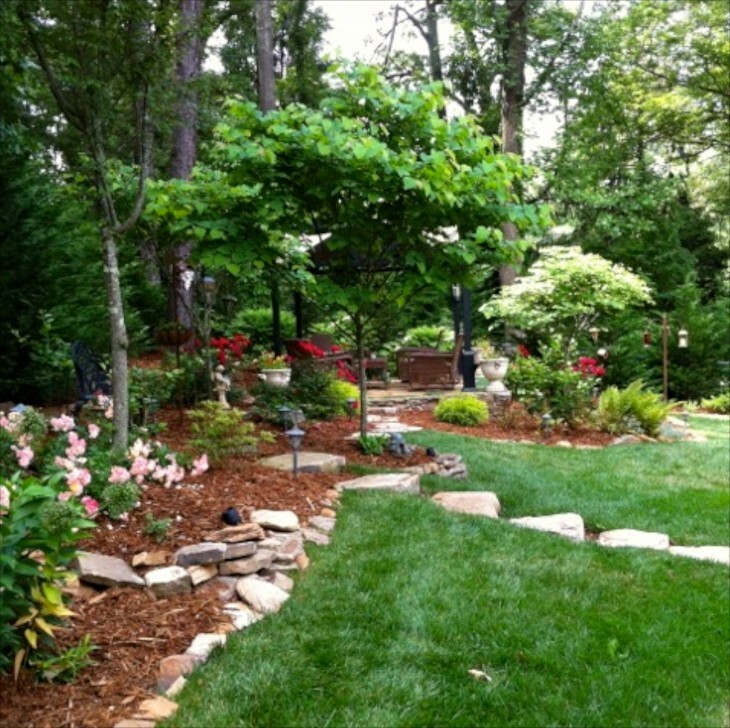 Great gardens plan for interest all four seasons. Roses and pansies……unusual to see them both still in full bloom where I live….most have bolted from heat, or look scraggly. Here they seem happy as can be. Mine were lovely during most of this last winter and early spring, but I pulled mine early when we had 90’s in March! 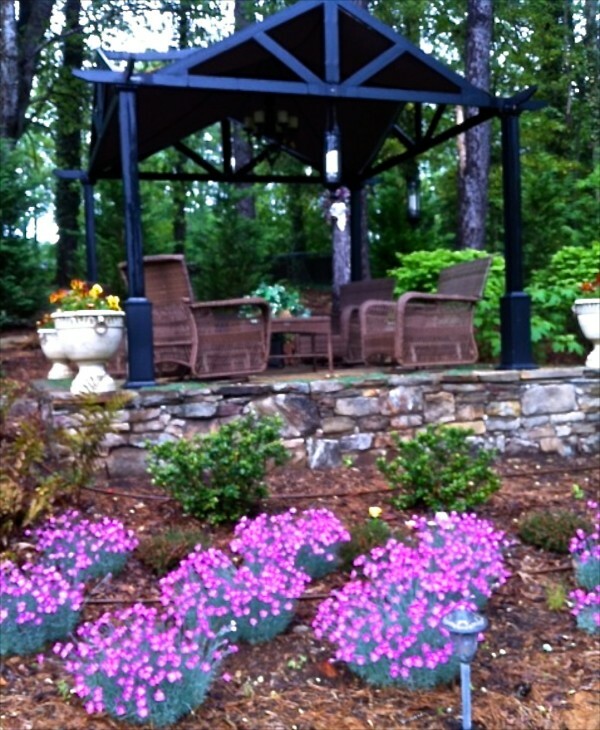 Pink Dianthus blooming in front of the gazebo. Several of these photos were taken June of this year. 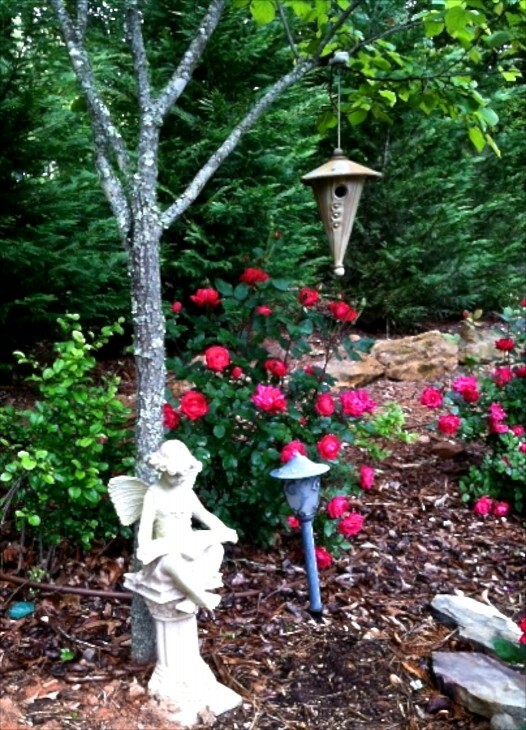 Drift roses behind the little girl statue from Biltmore Garden Center, which RM gifted to VM, and holds bird seed. 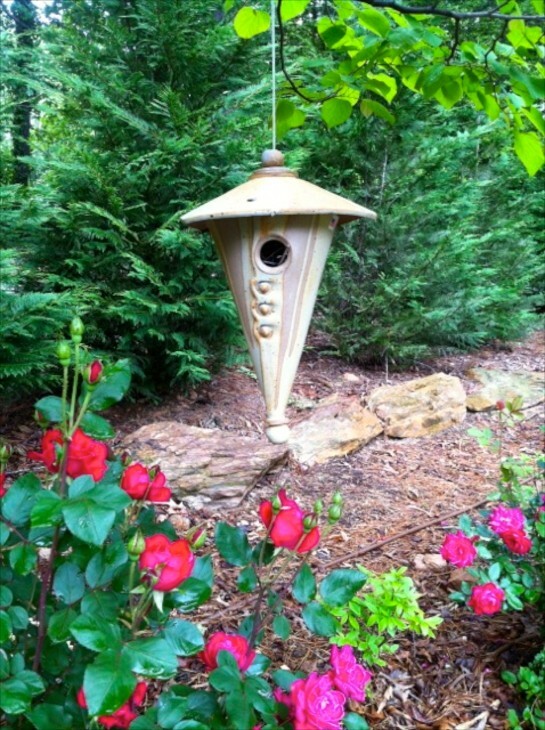 If you look closely, you can see twigs in the entrance……birds made a nest in this ceramic birdhouse. 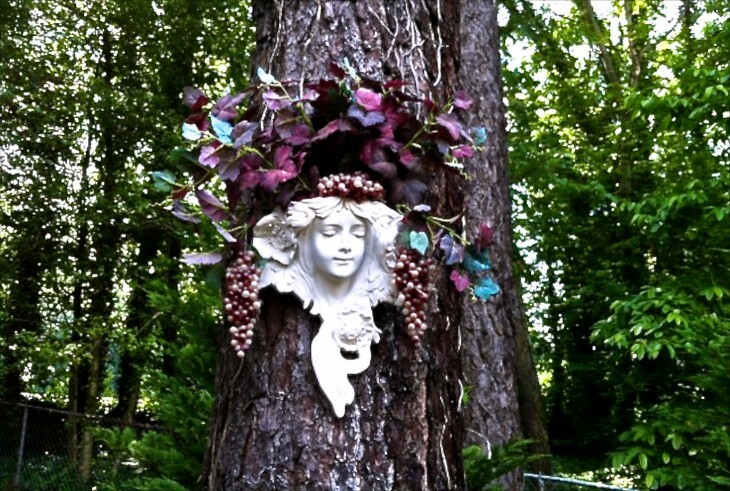 Artificial grapevine and grapes on this garden wall sconce looks so sweet hanging on a tree. 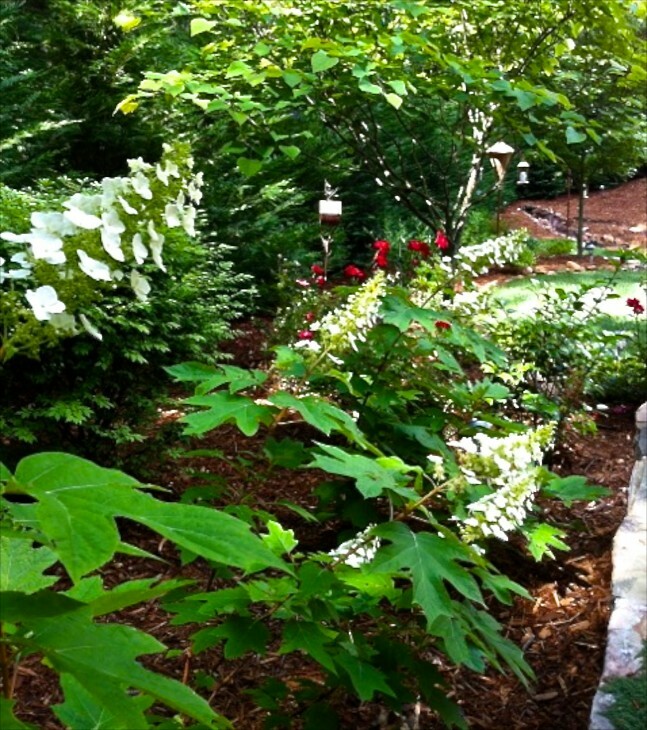 Their Oak Leaf Hydrangea is blooming for the first time! 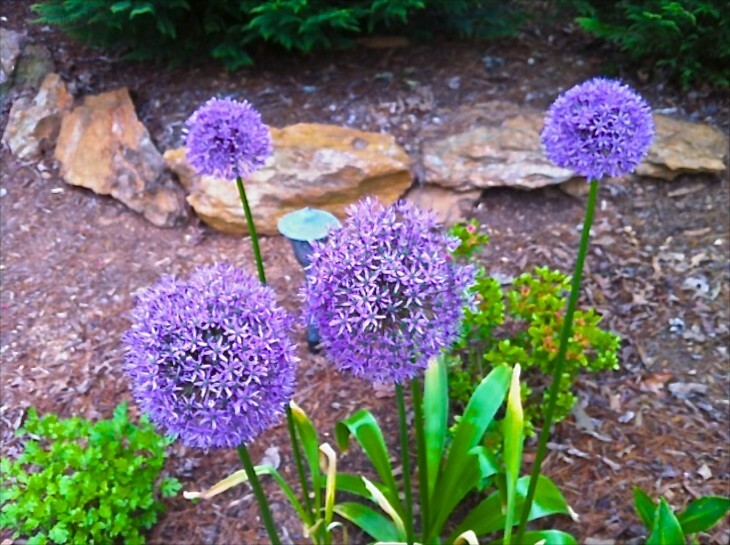 Allium, an easy and fun bulb to grow in the garden. Related to the onion family, this is a good bulb for beginners and it’s shape adds such fun interest to your flower beds. 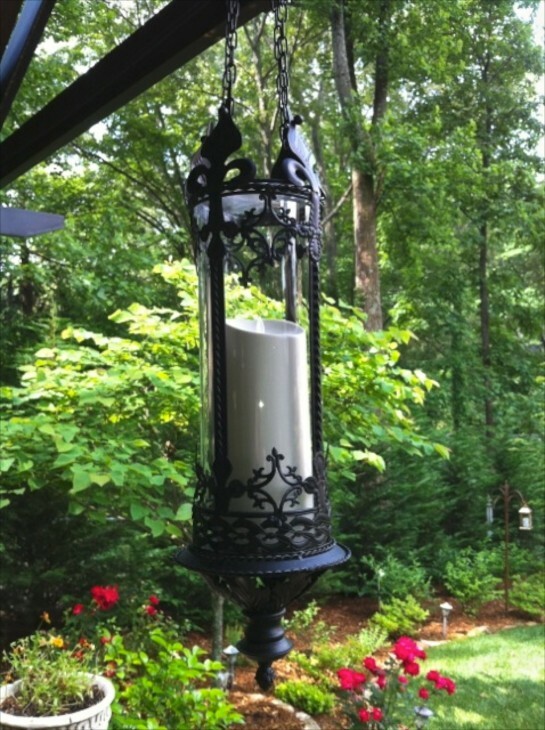 The candles are flameless in the gazebo chandelier, and can be turned on and off by remote control – so convenient when your lighting is so high up. 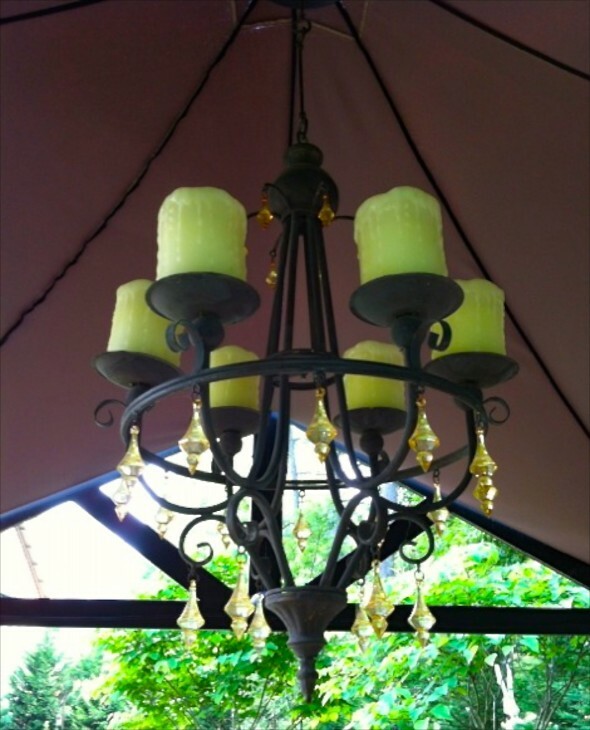 These lanterns are from the Biltmore Garden Center (yes, they live nearby, lucky folks!). The candles are flickering but flameless, and can be set on a timer. I have these and love them. You would swear that it is a live candle flame flickering, even close up. Men love these…..a cool bit of engineering. 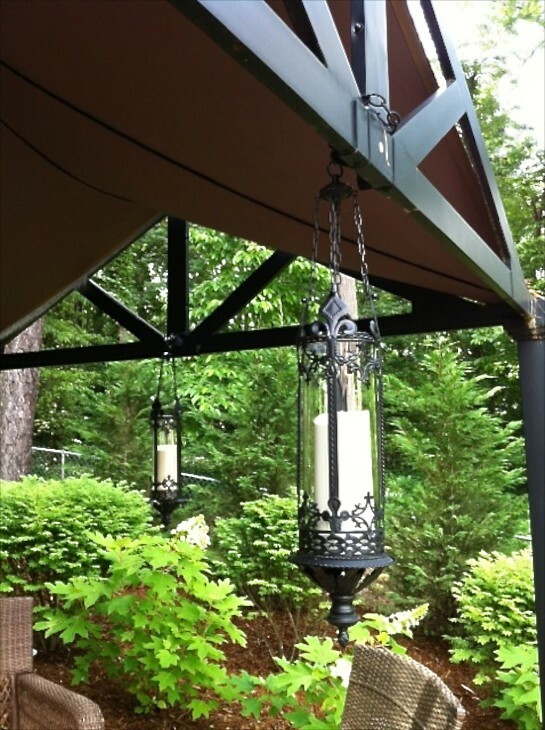 All the gazebo lighting can be seen at night from their back deck, and I am sure is just beautiful. 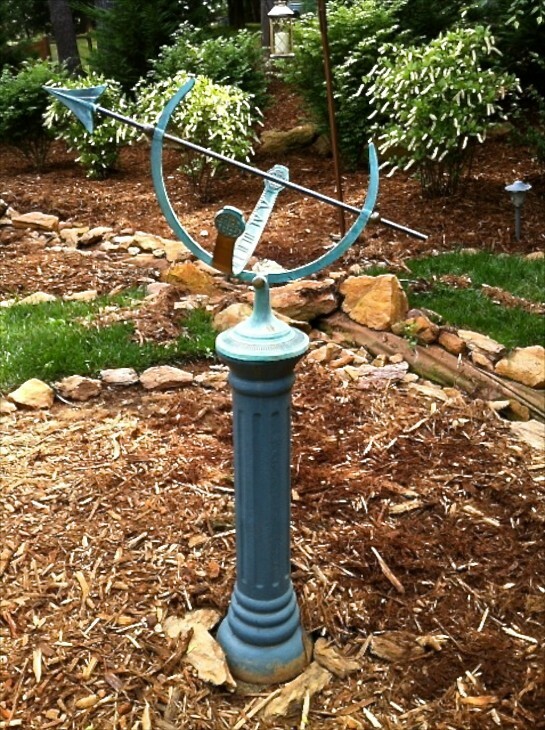 They purchased this sundial at the Biltmore Garden Center. Itea in the background. 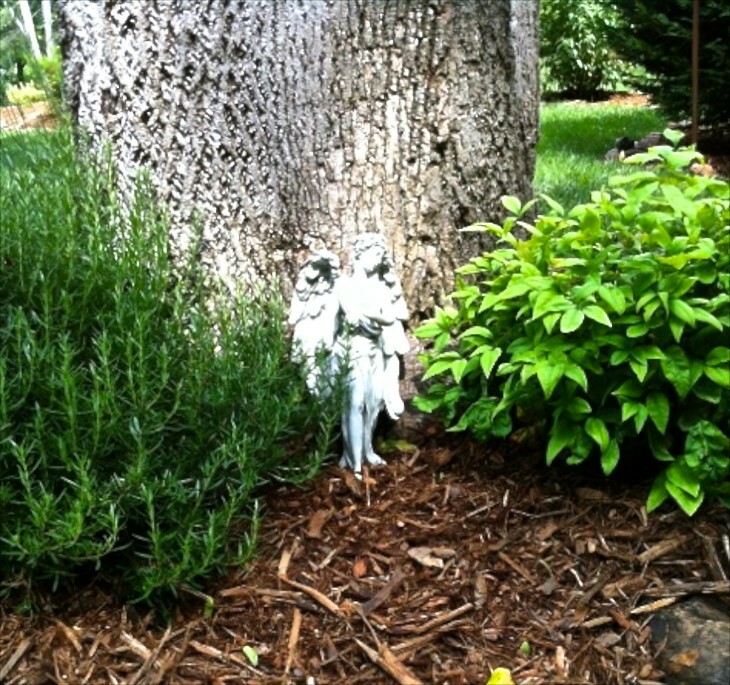 Herbs planted around a tree with angel statue adding further interest. Drift roses on the path to the gazebo. Notice how their use of large stones and stacked stone walls lends a visual weight to the garden that balances everything out. 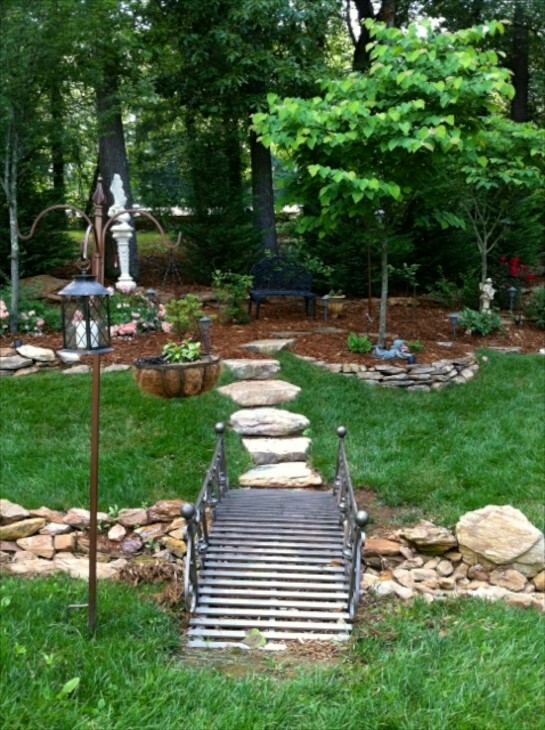 Bridge that leads to the gazebo in their back yard. 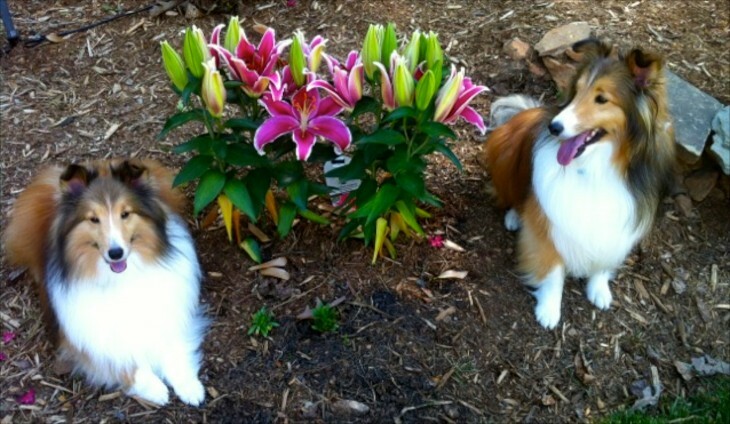 Mia and Connor relaxing in the garden. 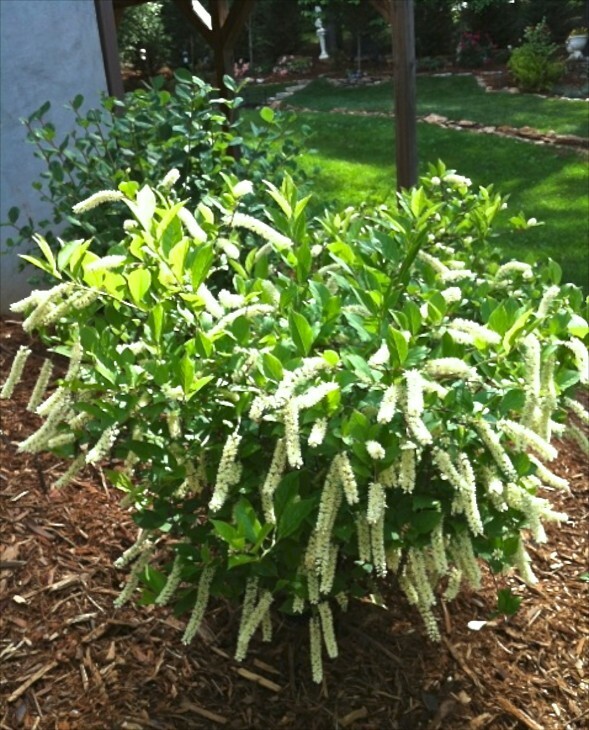 An Itea bush, also known as Virginia Sweetspire. One of the Proven Winners. Attractive to butterflies and deer resistant, this shrub has leaves that turn a brilliant red or orange in the fall. Wonderful shrub as a specimen or planted in mass on a bank. Spring blooming Rhododendrons on a bank. Pretty already, can you imagine when they are fully mature? 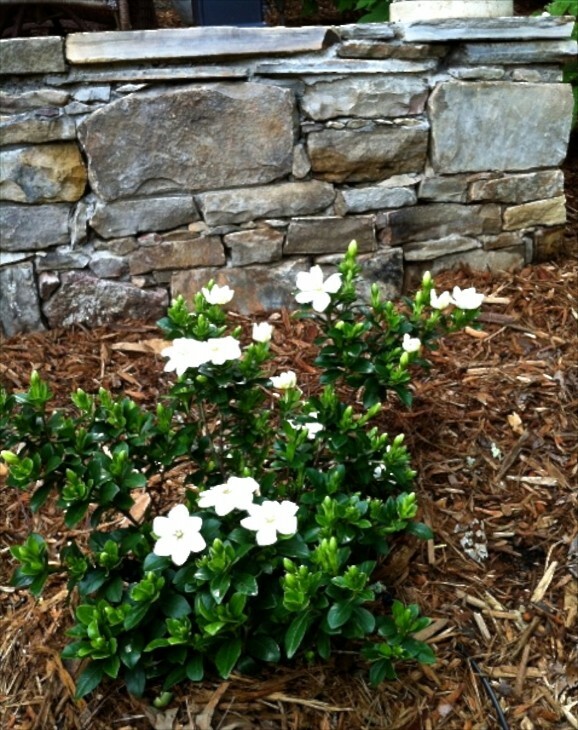 Dwarf Gardenia, same fragrance, smaller size. 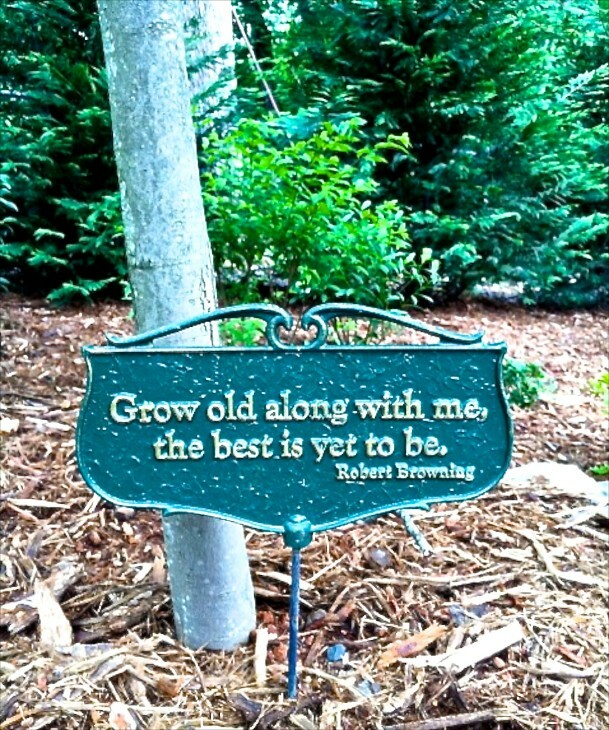 VM & RM planted an October Glory Maple and put this garden sign in front of it for their 25th wedding anniversary. 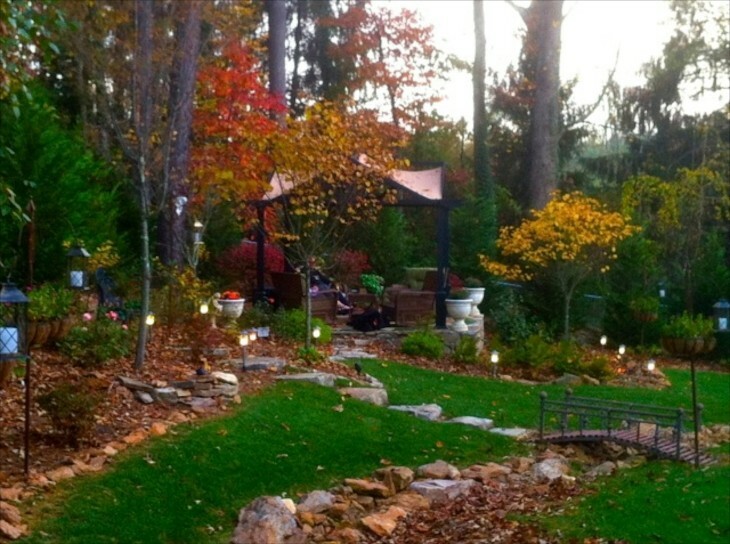 Autumn view of this amazing garden which provides interest all through the seasons. 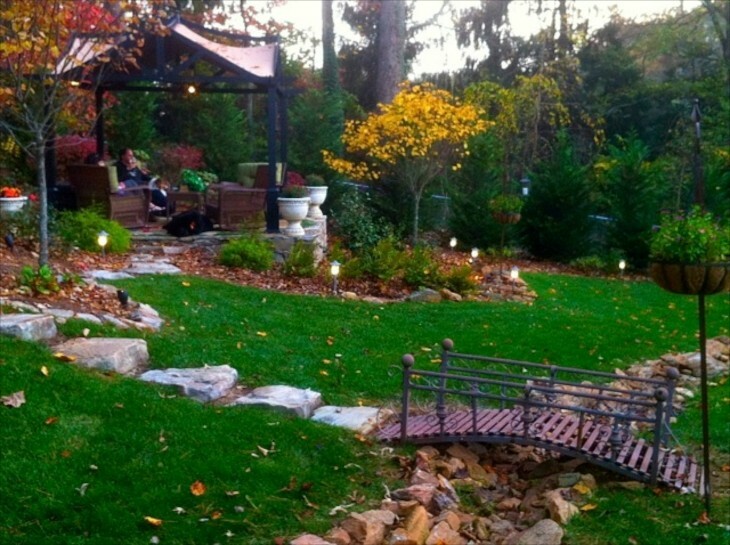 I would certainly enjoy a cup of coffee here despite a nip in the air. Mia and Connor thank you for visiting their garden. Beautiful Asiatic lily blooming. VM was inspired by her late Mother to love plants, trees and flowers and was lucky in love, marrying her husband who gardens and also has a mother who loves to garden as well. The poem below was written to honor VM’s mother, and she has given me permission to share it here. Enjoy. Pieces of my soul drip from my fingertips soaking the soil with nourishment for the fresh flowers. 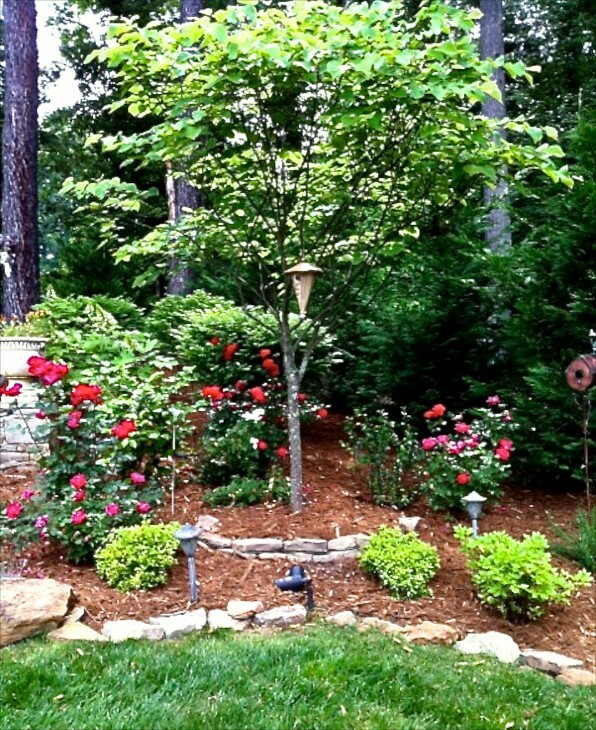 My passion for planting is renewed with the return of early spring. Now celosia and alyssum garnish the grey and white mailstand by the road. Within a week, the plum-purple clematis will boast its blooms as it climbs and clings to the post. The fuchsia cups of my tulips tip their soft green stalks to and fro in April’s waltzing wind. 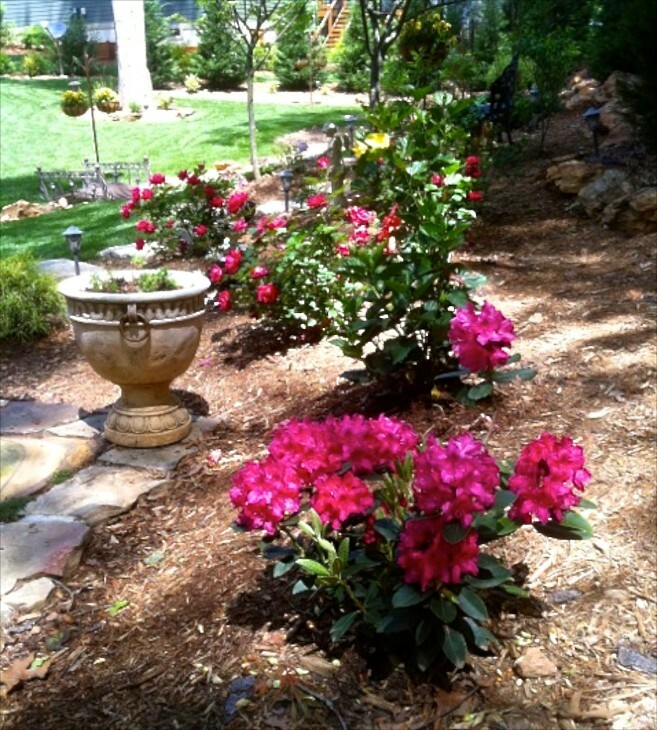 Clusters of pink and amethyst phlox float down the hill gracefully colliding with the crimson azaleas. 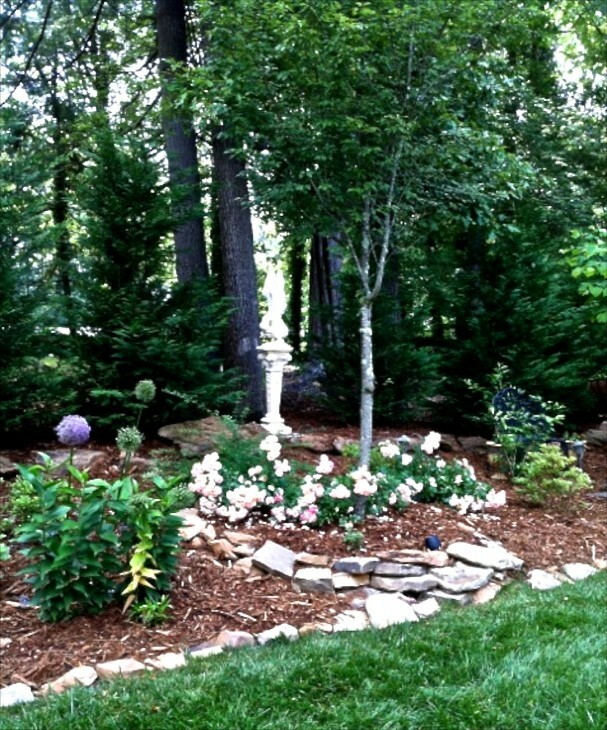 My prize peony is sleepily peeping through the wood chips, anticipating its summer debut. Oh the herb garden, my all-consuming horticultural obsession. Cinnamon basil, bee balm, rosemary and rue. And slender silver wind chimes provide the faint percussion with every tender tap of tone against tone. To Kincaid’s palette. In the past, they have posed for Renoir and Monet. They are the faithful favorites of every photographer. I implore you, my Tea Ladies, to grace my floral fields with the beauty of your humble presence. A bouquet of poetry in my garden of friendship. Wow Charisse..this is spectacular! 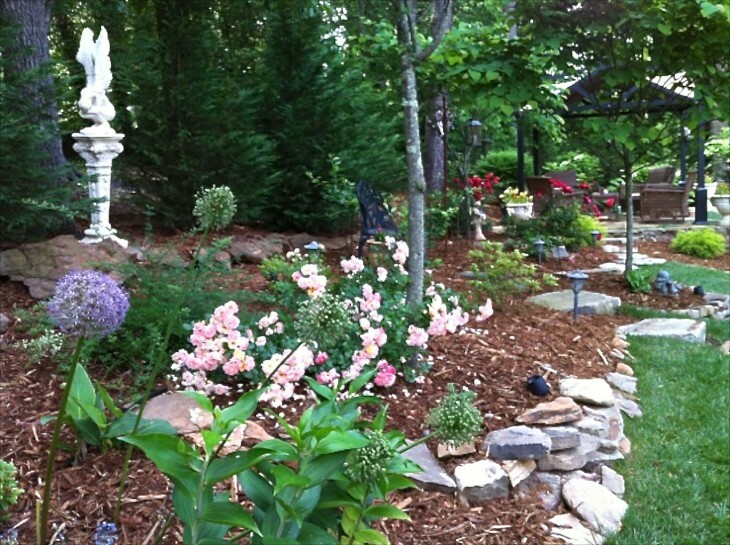 So lush and pretty and love the two “gatekeepers” who oversee the grounds….beautiful! They have done such an impressive job with this garden.So pretty in the photos, I cannot imagine how beautiful it must be in person.